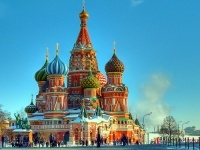 St Basil's Cathedral, with its multi-coloured domes, is the most famous landmark in Russia. The cathedral stands on the edge of Moscow's Red Square, a striking design that was commissioned by Ivan the Terrible to commemorate his victorious military campaign against the Tartar Mongols at Kazan in 1552. Legend has it that Ivan was so overwhelmed by its beauty that he had the architect blinded to prevent him from creating anything to rival it. St Basil's Cathedral includes a central chapel surrounded by eight tower-like chapels, each crowned with a different coloured and uniquely patterned onion-shaped dome. The church escaped demolition many times during the city's turbulent history and with the beginning of the Soviet regime the cathedral was closed and later turned into a museum. The interior is a dimly lit maze of corridors and delicately decorated chapels, one of them houses a priceless 16th century screen, decorated with icons, that shields the inner sanctuary. In comparison to the exquisite exterior, the interior can seem disappointing, but there is no question St Basil's is worth exploring. Transport: Metro stop Kitai Gorod. Opening times: The museum is open 11am to 5pm in winter, and 10am to 7pm in summer.